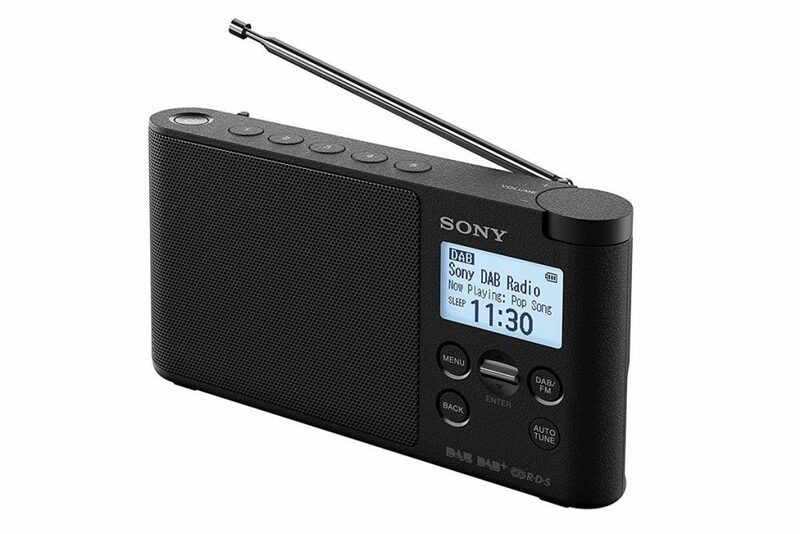 The Sony XDR-S41D is the latest digital portable radio from Sony. We praised its predecessor in our Sony XDR-S40DBP review for its functional design and build quality. Launched in 2017 the portable radio can receive FM, DAB and DAB+ stations. A fully adjustable telescopic aerial is mounted on the back of the radio. The user instructions contain some brief tips on making the most of DAB reception. A large backlit display shows the name of the digital radio station, scrolling text, the time, mode (DAB or FM), battery level and whether a sleep timer is activated. The backlight will go out after 30 to conserve power. The Sony XDR-S41D can be powered using the included AC adapter or four AA batteries. When powered on for the first time the radio will scan for DAB digital radio stations automatically. The radio can be switched to FM mode or DAB mode with the dedicated button on the front of the unit. Stations are selected using the jog lever on the front of the radio. This is clicked up or down to go through the list of stations, four of which are displayed on the screen when choosing a station. There are plenty of good-looking digital radios, but once using one becomes part of a daily routine you soon realise the touches that make a radio easier to use. With the XDR-S41D Sony has carried over the top mounted power button and a volume knob. Given how light and shallow some DAB sets are it’s quicker to push down on the radio or turn a knob than press fiddly buttons on the front. The radio comes in black, white, red and blue – all in a matt finish. The speaker grille takes up around two thirds of the front of the radio. Buttons for changing station and using the menu are found on the right. This makes it easier to use with one hand. A user manual is included in a large sheet format, covering setup and important operations. Verdict: The Sony XDR-S41D improves on its predecessor with a bigger screen and dedicated preset buttons while maintaining a smart, functional design.